This is a great article on Sarah and how she fits the bill for conservatives. Also, read the comments…there are several from Alaskans and at least one from a resident of Wasilla. As many of you know quite well by now, Obama is not only not remorseful about the Black Liberation Theology preached at his home church of 20 years (you might know it by its other name…Marxism) but is, indeed, most likely planning to bring it to your town under its new name, American Liberation Theology. To defend against the sparkling teeth and omnipresent smile of Dr. Obama, we need someone on the ticket that can match his youthful charisma and Ivy League brain power. I believe Bobby Jindal is the GOP’s secret weapon. He’s a great communicator, he is the embodiment of the American dream, and he has enough REAL star power to pull the spotlight away from Obama. BATON ROUGE, La. — Before Sen. John McCain could begin speaking at a town-hall meeting here Wednesday, he first had to quiet a crowd gone wild for Republican Gov. Bobby Jindal — a politician who not long ago would have been inconceivable in Louisiana. Gov. Jindal, a child of Indian immigrants who has a gift for oratory, is the first minority to govern Louisiana since African-American P.B.S. Pinchback held the office for 35 days during Reconstruction. The similarities between the 36-year-old Gov. Jindal and Illinois Sen. Barack Obama are tantalizing to many in the Grand Old Party. After only 143 days as the nation’s youngest sitting governor, Gov. 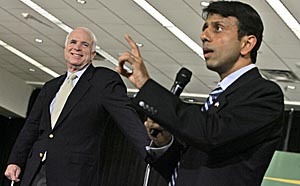 Jindal’s name is being bandied about as a potential running mate for likely Republican presidential nominee Sen. McCain. “The governor has been able to reach across the aisle and get things done for the people of Louisiana, help the folks in New Orleans in the recovering from the storm,” Sen. McCain said of Gov. Jindal, during a news conference.